The Bridge of San Luis Rey is American author Thornton Wilder's second novel, first published in 1927 to worldwide acclaim. It tells the story of several interrelated people who die in the collapse of an Inca rope-fiber suspension bridge in Peru, and the events that lead up to their being on the bridge. A friar who has witnessed the tragic accident then goes about inquiring into the lives of the victims, seeking some sort of cosmic answer to the question of why each had to die. The first general issue edition of this book was actually released in London, a few days before the first American edition. In the United States, the first edition was preceded by a very limited "preliminary" print run of around 22 copes, identifiable in part by the lack of a thin green border and printer's device on the title page. The first general edition in the US comprised somewhere between 7,000 and 9,000 copies. sergerca (Wadsworth): We all have a worldview (don't we?) that influences just about everything we encounter. Literature is no exception. Perhaps that is why I thought the main point of Thornton Wilder's outstanding The Bridge of San Luis Rey was so obvious.In many of the reviews I've read, many have stated that Wilder leaves the main conclusion up to the reader. I must disagree. The final line, so quoted by many of the reviewers, makes it all very clear to me. "All those impulses of love return to the love that made them." Perhaps, had Wilder capitalized the second "love" more would have drawn the same conclusion as I. That love is, of course, the love of the Father. This short book is rooted in Christian realism -- summed up in that final page. Life and God's ways as they pertain to life, are a mystery to the believer. Seemingly saintly people die far too early in inexplicable circumstances-- a bridge that has lasted for centuries one day breaks under the weight of an old woman, a cripple, an old man, a young girl, and a young man. But the "why" is not for us to know. We all must live in the comfort that it is His will that reigns, not ours, and that the love which sustained us in this life will see us to the next. Perhaps Brother Juniper found his answer. I know I recognized mine. Albert & Charles Boni, 1927 First Edition, First Printing SIGNED by Thornton Wilder. An attractive First Issue dustjacket with the minor wear to the edges. This original unsophisticated dustjacket has the $2.50 price present on the front flap. The book is in nice condition. The binding is tight, with light wear to the spine. The pages are clean with no marks or bookplates in the book. Overall, a lovely copy SIGNED by the author housed in a custom clamshell slipcase for preservation and presentation. We buy Wilder First Editions.. Signed by Author(s). 1st Edition. Hardcover. Fine/Near Fine. New York: Albert & Charles Boni, 1927. First Edition. Hardcover. The book is slightly cocked. The dustwrapper has mild chipping to the spine tips and the upper front corner. Near Fine in a Very Good dustwrapper. First Trade Edition, with title page printed in green and black. Preceded by the "preliminary issue" of 21 copies and the London edition by a few days. Illustrated by Amy Drevenstedt. Winner of Wilder's first of three Pulitzer Prizes, this copy is INSCRIBED and SIGNED by the author on the half-title page to "Dr. Samuel Rosenfeld/with the regards of/Thornton Wilder" and dated "New Hope, Penn./July 1948." Albert & Boni, 1927 First Edition, First Printing SIGNED by Thornton Wilder on laid in signature. A spectacular dustjacket that is vibrant in colors with no chips or tears. This original first issue dustjacket has benefitted from professional restoration. The end result is a stunning copy seldom seen in this nice of condition. The book is in great shape. The binding is tight, and the boards are crisp with minor wear to the edges. The pages are exceptionally clean, with no writing, marks or bookplates in the book. Overall, and ideal copy SIGNED BY THE AUTHOR.. Signed by Author(s). 1st Edition. Hardcover. Fine/As New. New York: Albert & Charles Boni, 1927. First edition of the author's masterpiece and winner of the Pulitzer Prize. Octavo, original cloth, cartographic endpapers. Inscribed by the author on the half-title page, "For Milton J. Lesser with the regard of Thornton Wilder New Haven March 1930." Also laid in is a signed handwritten letter to the recipient from Wilder. Fine in a near fine dust jacket with light wear. Housed in a custom half morocco clamshell box. Illustrated by Amy Drevenstedt. A superior example of the dust jacket, which is prone to wear. "Few novels identify their basic plotline as succinctly and forthrightly as the opening line of Thornton Wilder's 1927 novel, The Bridge of San Luis Rey: "On Friday noon, July the twentieth, 1714, the finest bridge in all Peru broke and precipitated five travelers into the gulf below." The novel's conceit is this: a certain Brother Juniper was himself about to step out onto the bridge when it broke and subsequently witnessed the plunge of five people into the abyss below. Brother Juniper wonders if the tragedy happened according to a divine plan or was simply a random instance of misfortune. His curiosity leads him to investigate the lives of the five victims to prove that the bridge collapse and the resulting deaths were indeed divine intervention--that God intended for them to die then and there. But, of course, the point of the novel is that there is no commonality among them, other than the fact that they are all simply human, with their own frailties. Wilder ends his at-once urgent and serene novel with this haunting passage: "But soon we shall die and all memory of these five will have left the earth, and we ourselves shall be loved for a while and forgotten. But the love will have been enough; all those impulses of love return to the love that made them. Even memory is not necessary for love. There is a land of the living and a land of the dead, and the bridge is love, the only survival, the only meaning" (Brad Hooper). "One of the greatest reading novels in this century's American writing...Wonderfully lucid reading" (Edmund Fuller). Named by Modern Library as one of the 100 greatest novels of the 20th century and named by Time Magazine as one of its 100 Best English-language novels from 1923-2005. London: Longmans, Green & Co., 1927. First Edition. Hardcover. Briefest of wear to the spine tips of the book. Dustwrapper with a long closed tear along the front flap joint (neatly masked by the mylar protector), chips at the spine tips but not affecting the lettering, and general edgewear with the spine darkened. About Fine in a scarce, Very Good example of the dustwrapper. First British Edition, preceding the American edition by a few days, of this winner of Wilder's first of three Pulitzer Prizes. INSCRIBED and SIGNED on the the front endpaper: "For Mrs. Isaacs/with the affection/of one of her/boys/Thornton/Lawrenceville/November/1927." The recipient appears to be Edith Isaacs, editor of THEATRE ARTS magazine, whom Wilder befriended in the early 1920s while teaching at the Lawrenceville School in New Jersey. Isaacs offered much encouragement to Wilder, including recommending that he apply for a Guggenheim Fellowship in order to finish THE BRIDGE OF SAN LUIS REY, for which he was declined. New York: Albert & Charles Boni, 1927. First edition of the author's masterpiece and winner of the Pulitzer Prize. Octavo, original cloth, cartographic endpapers. Presentation copy, inscribed by the author, "For Vincent Starrett: with all the regard of Thornton Wilder Chicago April 1929." Laid in is a lecture pamphlet by Thornton Wilder, with the introduction done by Starrett. The recipient Vincent Starrett, was an American writer, newspaperman, and bibliophile. Starrett's signature and bookplate, near fine in a near fine dust jacket with light rubbing and wear. Illustrated by Amy Drevenstedt. Housed in a custom cloth and chemise box. "Few novels identify their basic plotline as succinctly and forthrightly as the opening line of Thornton Wilder's 1927 novel, The Bridge of San Luis Rey: "On Friday noon, July the twentieth, 1714, the finest bridge in all Peru broke and precipitated five travelers into the gulf below." The novel's conceit is this: a certain Brother Juniper was himself about to step out onto the bridge when it broke and subsequently witnessed the plunge of five people into the abyss below. Brother Juniper wonders if the tragedy happened according to a divine plan or was simply a random instance of misfortune. His curiosity leads him to investigate the lives of the five victims to prove that the bridge collapse and the resulting deaths were indeed divine intervention--that God intended for them to die then and there. But, of course, the point of the novel is that there is no commonality among them, other than the fact that they are all simply human, with their own frailties. Wilder ends his at-once urgent and serene novel with this haunting passage: "But soon we shall die and all memory of these five will have left the earth, and we ourselves shall be loved for a while and forgotten. But the love will have been enough; all those impulses of love return to the love that made them. Even memory is not necessary for love. There is a land of the living and a land of the dead, and the bridge is love, the only survival, the only meaning" (Brad Hooper). "One of the greatest reading novels in this century's American writing...Wonderfully lucid reading" (Edmund Fuller). Named by Modern Library as one of the 100 greatest novels of the 20th century and named by Time Magazine as one of its 100 Best English-language novels from 1923-2005. London: Longmans, Green and Co, 1927. First UK Edition. Hardcover. Wilder's Pulitzer Prize-winning novel grappling with the mysteries of life and death, chance or the hand of God. Basis for three notable film adaptations. First Impression. Octavo (20.5cm); navy blue cloth with titling stamped in gilt; gray topstain; dustjacket; 140pp. Wilder has signed his name on the front endpaper in an early hand, above which he has added a simple line drawing of a broken bridge. Light offset from jacket onto endpapers, some minor darkening to lower board edges, with a faint stain to lower text edge; Near Fine. Dustjacket is price-clipped, moderately sunned at the spine and flap folds, with some shallow chipping at the spine ends and short tears along the front flap fold at the corner; Very Good+. New York: Boni & Liveright, 1927. First. hardcover. fine. 8vo, re-bound in full green morocco with a cloth inset from the original pictorial cover. N.Y.: A.&C. Boni, 1927. First Edition . Presentation copy, " For John, with all my best, Thornton/ Davis, April 1928" . Fine copy of this Pulitzer Prize novel. London: Longmans Green & Co. Ltd, 1927. Book. Very Good. Hardcover. Signed by Author(s). First Edition. 1927 Longman's Green TRUE FIRST EDITION preceding the US First by a matter of days. A VG+/VG copy of this rare first made even more so by having a splendid handwritten and **SIGNED LETTER** by Mr. Wilder. The HB is very clean and tight with just some browning on the end pages. The unclipped DJ has a small piece missing from the upper spine end not affecting the title. There are a few tiny other chips now in mylar and protected. A very strong copy and a wonderful combo!. London: Longmans, Green and Company, 1927. First Edition. Hardcover. Very Good. First edition, first printing; British edition precedes the American. Near Fine in a Near Fine unclipped dust jacket. Light bumping to bottom inner corner of pages and boards. Dust jacket is lightly edge worn with shallow loss at the base of the spine; toning to spine panel. A very presentable copy of this Pulitzer Prize winning novel, rarely seen in such nice condition. New York: Albert & Charles Boni, 1927. First Edition. Hardcover. Very Good. First American edition, first printing. Signed by Thornton Wilder on the title page. Very Good, lacking the dust jacket. Lightly bumped at corners and spine ends; cloth lightly rubbed at extremities. Light dust soiling to top edge. Small nick to top edge of front free end paper. Previous owner book plate to first blank page. First American edition of the Pulitzer Prize winning novel, signed by the author. New York: Boni, 1927. First edition. Signed by Wilder on the half-title. Bound in full dark brown goatskin, gilt, with green leather label, a.e.g., for Asprey & Gerrard. Very fine condition. New York, NY: Albert & Charles Boni. 1927. Hardcover. Good, extremities rubbed; INSCRIBED BY THE AUTHOR "To Seymour Blankfort/with all the/regards of/Thornton Wilder/.....ville/June 1929". 1927 Ptg. Title pg is printed in black and green. Seymour Blankfor was the father of author and screenwriter Michael Blankfort. ; 1927 Ptg; Taupe cloth; 8vo; No DJ; Signed by Author . NY: Albert & Charles Boni, 1927. The true first trade edition with the title page printed in green and black. Books shows a bit of shelf wear to bottom edge. Fitted with a later state dustwrapper (published in 1928) that maintains the $2.50 price but has a list of four books on the back panel that were published by Boni in that year). The book is tight and clean and the dustwrapper shows well in mylar. Signed by the author on a bookplate affixed to the half title page. . AUTHOR-SIGNED. First American Edition. Hard Cover. VG+/VG+ (later state). Illus. by Amy Drevenstedt. New York: Albert & Charles Boni, 1927. First Edition, First printing. Hard Cover. SLIGHTLY BUMPED SPINE ENDS, OTHERWISE THIS IS A TRULY FINE COPY - BRIGHT CLEAN SPINE LETTERING, BOARDS, PICTORIAL ENDPAPERS, AND TEXT. NO WRITING OR NAMES. FIRST STATE DUST JACKET IS VERY GOOD TO VERY GOOD+ WITH ORIGiNAL $2.50 PRICE, GOOD COLOR, LIGHTLY SUNNED SPINE AND SMALL EDGE CHIPS. Longman's Green & Co, 1927. First Edition. Hardcover. Very Good/Very Good-. Signed. Laid in is aa approximate 3"x5" slip of paper inscribed ("Best wishes of"), SIGNED by Thorton Wilder, and followed by "Washington D.C. April 1948". The slip has a horizontal crease above the inscription and is in very good/near fine condition. The volume has light offsetting on the endpapers from the pastedowns and (facing) pages 13 & 15 have 3/8" jagged tears on the top edge (possibly a page cutting glitch, because the tear on page 15 does not go through on the verso, page 16). The unclipped dust jacket is missing 3/8" on the spine crown, has a sunned spine, has a 1/8" chip on the top of the front panel and shallow chips on the corners and spine tail. The jacket, sleeved in mylar, is also rubbed and age toned on the flap tops. This is the true first of this pulitzer prize novel, as it precedes the US edition. New York: Albert & Charles Boni, 1927. First American Edition. Hardcover. Very good. Octavo, 235pp. Original tan cloth covers. Lightly bumped corners and spine. Subtle staining of front cover, near top. Lacking original dust jacket. Evidence of bookplate removed from end paper. Illustrated by Amy Drevenstedt, with reproduction dust jacket for attractive presentation. Book is inscribed by Thornton Wilder with the following inscription: "For Mary E. Teeter/ with the regards of/ Thornton Wilder - Columbus/ Jan 1931." This is the second novel of famed writer Thornton Wilder. This novel would earn him the Pulitzer Prize in 1928 and become a worldwide best seller. New York: Albert & Charles Boni, 1927 1st ed/6th printing Dec 1927, long inscription on the first title page in author's handwriting and signed by Author and Biller Houser to a Helen Lord, in the inscription gives a hint to who these people were, they were fellow teachers at an all male prep school named The Lawerenceville School in NJ, were Mr Wilder taught FRENCH, and had close ties to Princeton. BOOK: is very clean and the sections(signatures) are still very well bound,but the webbing between them is showing at some places, still very secure and held together tightly,other than that appears to be better than the Good+ I rate it.. included is a 9th printing,with its dustjacket which has chips and darken spine,maybe use it to protect the good one. New York: Grosset & Dunlap, 1928. Seventeenth Printing, December, 1928, published by Grosset & Dunlap in arrangement with Albert and Charles Boni. SIGNED BY AUTHOR on half title page. The book, in original grey cloth with illustrated endpages and Amy Drevenstedt illustrations, is Near Fine, separation of page block at head of spine. In a Very Good dust jacket, small chips at head and heel of spine and light rubbing. First Edition was published a year earlier in November, 1927. Pulitzer Prize winner in 1928, and filmed in 1929, 1944, and 2004.. SIGNED. 17th Printing. Cloth. Near Fine/Very Good. Illus. by Amy Drevenstedt. The First UK Printing published by Longmans, Green & Co. (London) in 1927. The BOOK is in Very Good++ condition. Mild pushing at the spine ends with light bumping and rubbing at the corners. Free from inscriptions and erasures. Mild offsetting to the end papers. Toning to the text block and very lightly to the page edges. Black top-stain still present but has faded. The covers are lightly age marked in places. The fragile paper WRAPPER is complete and is in Very Good++ or better condition. Light edge wear with a little loss at the upper spine and corners. Light toning to the spine and folds. Some closed tears to the spine ends have tape reinforcement on the verso ( which does not show through to the front). The period wrapper is in lovely condition for its age and looks very striking in the removable Brodart archival cover. Precedes the American edition by a few days. Wilder's classic novel, winner of 'The Pulitzer Prize' and basis for three film versions, in 1929, 1944 and 2004. Scarce with such attributes. Ashton Rare Books welcomes direct contact. London: Longmans, 1927. A first edition, first printing published by Longmans in 1927. A fine book without inscriptions in a very good unclipped wrapper with some shallow chipping to the spine tips. Complete with wrap-around band with reviews. Rare. London: Longmans, Green and Co, 1927. Cloth. Very Good/Very Good. A crisp, tight copy of the true 1st edition of Thornton Wilder's second published book. Solid and VG in its blue cloth, with light, forgivable foxing to the pastedowns, endsheets and inner hinges. Tasteful bookplate as well at the front free endpaper. And in a bright, price-intact, VG dustjacket, with very light chipping at the spine ends and light chipping to the panel edges. Octavo, 140 pgs. 8vo. New York: Albert & Charles Boni, 1927. 8vo, 235 pp. illustrated by Amy Drevenstedt. Original grey boards printed in green and black, map endpapers, original dust-jacket with $2.50 price intact. Dust-jacket somewhat worn, backstrip panel with some worm holes and a 1-inch tear to top of lower joint. Internally little age-toned but otherwise clean. First edition. Wilder’s second novel and the winner of the 1928 Pulitzer Prize. The story of a Franciscan Friar who witnesses the deadly collapse of a woven Inca rope bridge and who inquires into the lives of the victims in an attempt to discern divine providence. It has been adapted three times for film. New York: Albert & Charles Boni, 1929. Limited to 1100 copies SIGNED by Rockwell Kent and Thornton Wilder. About fine. Limited to 1100 copies SIGNED by Rockwell Kent and Thornton Wilder. Illustrated in color by Rockwell Kent. Small 4to. Light green cloth with pictorial designs in color and leather spine label. Lond and New York: Longmans, Green and Co., 1930. Illustrated Edition, by Clare Leighton (1899- 1988) Inscribed by Leighton: "To Miss Bogue, . New York, December 1930" on fep. Dust Jacket has edgewear chips to spine, art ok. New Impressions, Feburary, 1930. 140 pgs. 16 woodcuts. Rare Signed Illustrator. Illus. by Woodcuts By Clare Leighton. Literature. Signed by Illustrator. Early Edition. Cloth. Very Good/Very Good. New York: Albert & Charles Boni 1927. 8vo. 235 pp. Bound in a recent half dark green morocco over green marbled boards. Raised bands to spine with gilt lettering. Top edge gilt. The original endpapers have been preserved. Several b/w illustrations. . Very Good. Half Morocco. First Edition. 1927. New York:: Albert & Charles Boni. Cloth. 235 pp. 8vo. First edition in a 4th printing dj. Boards lightly shelfworn, very light damp-spotting to textblock head. Hinge starting to split at pg 110, binding otherwise only lightly shaken. Interior clean, pages crisp. Dj chipped at spine ends and corners, closed "v" shaped tear near spine head, spine sunned. Not price clipped. . Very Good. 1927.. First edition. Albert & Charles Boni. Hardcover. B00085ZYCQ SIGNED by author and illus. (Rockwell Kent), ltd 1100c. Lackling slipcase. Color printed cloth lightly spotted, clear plastic jacket with tears. Leather spine label faintly rubbed. A wonderful copy! . Very Good. New York: Albert & Charles Boni, 1929. 1st Edition 1st Printing. Hardcover. Near Fine/Near Fine. Color Illustrations By Rockwell Kent. 123 Pp. Illustrated Cloth, Morocco Spine Label With Gilt Lettering, Top Edge Gilt. #1044 Of 1100 Copies Printed On Vidalon, Designed And Made By The Pynson Printers, Under The Direction Of Elmer Adle, Hand-Set From Baskerville Type Cast At The Village Foundry Of F. W. Goudy, Signed By Thornton Wilder And Rockwell Kent. Near Fine, No Wear, Spine Slightly Browned, Covers With Small Areas Of Faint Soiling Or Discoloration, Spine Label Intact And Without Wear, In Fine Clear Dust Jacket. Lacking The Slipcase. NY: Albert & Charles Boni, 1929. Textblock very clean, unmarked and tight; Signed by Thornton Wilder and Rockwell Kent on the full-color lithograph at the rear, facing the limitation page; The boards are lightly edge-rubbed and minimally sunned; The spine is sunned to a light brown with the leather spine title complete and bright; This is copy 516 of 1100 and is protected by the original clear, five-mil mylar jacket. Lacks the slipcase. 123p.. Signed by Author and Illustrator. Limited Edition, #516 of 1100. Cloth. Very Good+. Illus. by Rockwell Kent. 4to - Over 9 ¾" -12" Tall. Hardcover. New York: Charles Boni Paper Books, 1929. Medium gold-brown cloth, spine lettered in gilt. Very minor rubbing to spine ends, otherwise a very good copy. Clothbound issue of the Boni Paper Books printing, inscribed by the author on the free endsheet "...for Marion P. Phinny with the regards of Thornton Wilder / Town Hall N.Y. Feb 3. 1936." Albert & Charles Boni, 1929. Number 937 of a Limited Edition of 1,100 copies, SIGNED BY THORNTON WILDER and ROCKWELL KENT on the illustration opposite the limitation page. Very good plus with spine slightly cocked and sunned, otherwise clean and tight. Neat gift inscription on flyleaf. In a very good example of the original slipcase that has slight loss and cracking to the lower outside corner.. Signed by Author. First Thus. Illus. by Rex Whistler. Buccaneer Books, 1991-06-01. Hardcover. Very Good. A nice copy SIGNED and inscribed by author. December 1928, 17th printing. No DJ. Cover shows some wear Binding is tight. Your Satisfaction Guaranteed. We ship daily. Expedited shipping available. Albert and Charles Boni, 1928-01-01. 17th. Hardcover. Very Good. Signed by Author. A nice copy SIGNED and inscribed by author. December 1928, 17th printing. No DJ. Cover shows some wear Binding is tight. Your Satisfaction Guaranteed. We ship daily. Expedited shipping available. New York: Albert & Charles Boni, 1927. First edition. Hardcover. Very good condition. Amy Drevenstedt. 235p. 2004-09-02. New. Ships with Tracking Number! INTERNATIONAL WORLDWIDE Shipping available. Buy with confidence, excellent customer service! Franklin Center, Pennsylvania: Franklin Library. 1976. First Edition; First Printing. Hardcover. Near Fine. Leather bound, Accented in 22kt gold. Printed on archival paper with gilded edges. The endsheets are of moire fabric with a silk ribbon page marker. Smyth sewing and concealed muslin joints. This book is in full leather with hubbed spines. A Limited Edition. ; 8vo 8" - 9" tall . New York: Albert & Charles Boni, 1927. First edition. Hardcover. Very Good. First edition, first printing of Wilder's classic novel. Title page printed in black and green. Book is attractively illustrated by Amy Drevenstedt. About very good condition with general light soiling to covers and a bump/crease to lower corner of front panel. Lacking the dustwrapper. This copy Signed in pencil by literary critic and editor Granville Hicks. Hicks would later write the introduction to the L.E.C. edition of this title. Nice association. 1929. KENT, Rockwell.. WILDER, Thornton. The Bridge of San Luis Rey. Original pictorial cloth. New York: Albert & Charles Boni, 1929. 4to. One of 1100 numbered copies, signed by the author and illustrator. Illustrated with lithographs by Rockwell Kent. Printed by the Pynson Printers. Spine very lightly sunned, minor rubbing to foot of spine, small bookplate, else very good or better. New York: Albert & Charles Boni, 1927 First edition, first printing. Publisher's light brown cloth, lettered in black and white, pictorial endpapers illustrated with a decorative map of Peru. A very good to near fine copy with light rubbing to edges of spine and corners, and a former owner inscription to endpaper. An attractive copy. Winner of the 1928 Pulitzer Prize, The Bridge of San Luis Rey tells the story of the fictional collapse of an Inca-made rope bridge in Lima, Peru, at noon on Friday, July 20, 1714. The novel is divided into five sections, each of which explores the bridge collapse from different perspectives; the first and last sections recount the event and its memorial as well as Franciscan monk Brother Juniper's six-year effort to chronicle the stories of the 5 victims of the collapse, while sections 2-4 flashback to the victims' lives and the events that led up to their deaths. 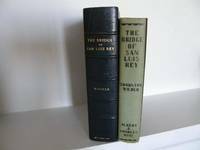 In addition to being one of his most popular texts, The Bridge of San Luis Rey is credited with establishing Wilder as a reputable American novelist.. 1st Edition.. Hardcover. Very Good. NY, LIMITED EDITIONS CLUB, 1962, 1962. SIGNED BY CHARLOT (ILLUSTRATOR); #40/1500; SLIPCASE FIRST EDITION THUS FINE. Signed by Author(s). F.
NY: Grosset & Dunlap, 1950. Reprint. 8vo, pp. 235. A fine copy in dj that has some chips at the top of the front cover and along the top of the spine, not affecting the printing of the spine title. Inscribed by the author: "For Miss Sara Glass in thanks for so much skill and kindness and in memory of many a good long friendly talk. With many regards ... Massachuetts General Hospital. March 28, 1951." Glass was probably a nurse who took care of the author when he was hospitalized with a bad back when he was lecturing at Harvard. A story of Peru. New York: Grosset & Dunlap. Very Good/Very Good Dust Jacket. 1928. Hard Cover. 8vo - over 7¾" - 9¾" tall Inscribed By Author Inscribed By THORTON WILDER. CLEAN 1928 very good hard cover with very good DUST JACKET. .
NY: Longmans, Green, 1929. First Illustrated Edition. Clare Leighton. 8vo, pp. ix, 140. 140, with 16 fine tipped-in wood-engravings by Clare Leighton on cream paper. A fine copy in little, scarce, soiled dj. A story of Peru. NY: Albert & Charles Boni, 1927. Book. Very Good. Hardcover. 1st Edition. 1927 Albert & Charles Boni FIRST EDITION stated 4th printing (December 1927) in VG/G condition. The HB is clean and tight with minor wear. The unclipped DJ ( $ 2.50) is later state ( 156th thousand) in GOOD condition missing a small piece at the top spine end. The colors are still bright..
New York: Longmans, Green & Co., 1928. SIGNED, inscribed and dated by the author on the title page. 140 pages in very good, clean condition; edges and endpapers a little yellowed. Previous owner's name on the fep. Photograph of the author pasted on the ffep. Blue cloth with gilt titles. Spine a little darkened and scuffed. Corners lightly bumped and rubbed. Binding good and tight.. Signed by Author. 9th Impression. Hard Cover. Very Good. London [etc]: Longmans, Green and Co., 1929. Octavo. Three quarter navy blue crushed morocco, raised bands, gilt extra, t.e.g., by Bayntun. Illustrated with tipped-in woodcuts by Clare Leighton. First Illustrated British edition. Very faint patch of dulling to cloth on lower board, otherwise about fine. London: Longmans, Green and Company, 1927. Very Good/Very Good. Later printing. Very good with some light fading on the boards, endpapers are browned, in a very good dustwrapper with loss of paper at the spine ends, light wear at the corners, a little age-toning.